Zucchini slice, zucchini soup, zucchini salad, zucchini pasta (with beans and bacon - oh my! ), zucchini with basil and garlic (mmmmm) - there are so many good things to do with zooks. How about turning some of the extra into sublime pickles, so you can remember the summer bounty during the cold days of winter? 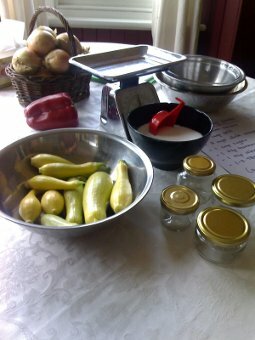 We're having a zucchini pickling session on Thursday 12th Feb, at Christina's place in South Hobart. Starts around 6pm for slicing and salting. Then we'll pick and eat some easy dinner, then do the final steps of spicing, cooking and bottling. FIMBY will provide all bottles, spices, labels etc, all you need to do is bring along your zucchinis. You can also pickle beans and carrots, very delicious, so feel free to bring those if you want to try some. Contact Christina ph 0437 009 792 for more details. Postscript: Check out our Gallery Page for the results of our work. You'll need to scroll down a bit . . .